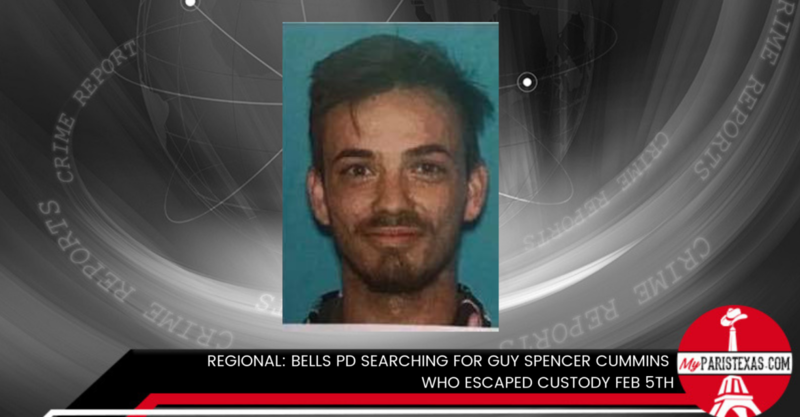 The Bells Police Department is searching for Guy Spencer Cummins who escaped from custody early this morning. If anyone sees this individual, call 911 immediately. DO NOT APPROACH. On February 5th, at 4:03 a.m. an Officer with the Bells Police Department initiated a traffic stop on a vehicle in the Exxon parking lot located at 205 W. Bells Blvd. in Bells, Texas. “The Officer learned the driver had outstanding warrants and took the suspect into custody, handcuffing the suspect behind his back. The officer has the suspect sitting on a gas pump barrier while filling out paperwork next to the suspect’s vehicle. The suspect ran from the location and cross Highway 56 and headed south on Branch Street. That was the last location the suspect was seen,” the Bells Police Department said In a statement released earlier this morning. The Bells Officer notified Grayson County Sheriff’s Dispatch and requested assistance. Several Deputies arrived in the area and held a perimeter. A K9 Deputy deployed his dog and tracked the suspect from the scene, down Branch Street to Elm Street. Eventually, the K9 lead the track out to Dale Hill Road and Highway 82 north of town. The track was lost at the point. We are asking the public’s assistance in locating Guy Spencer Cummins of Whitewright, TX. He has two outstanding warrants with the Grayson County Sheriff’s Office and Collin County Sheriff;s Office.